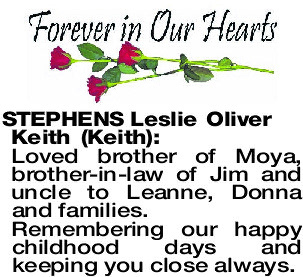 Loved brother of Moya, brother-in-law of Jim and uncle to Leanne, Donna and families. Remembering our happy childhood days and keeping you close always. 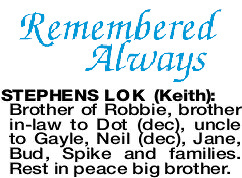 Brother of Robbie, brother in-law to Dot (dec), uncle to Gayle, Neil (dec), Jane, Bud, Spike and families. 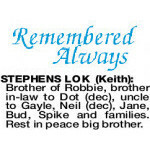 Rest in peace big brother.